Prior to leaving the U.S. Environmental Protection Agency, Briana Bill worked with small- and medium-sized businesses across the Midwest to prevent pollution, a vital task for an organization charged with defending the environment and public health. Based out of the EPA’s regional headquarters in Chicago, Bill, a 27-year veteran of the agency, helped provide technical assistance for businesses attempting to conserve energy and water, reduce hazardous waste and identify products that are safer for human health and the environment. “It was a small but powerful program that saved businesses lots and lots of money,” Bill said. In March, President Donald Trump released his proposed federal budget for 2018, which included a 31-percent cut to the EPA. Several weeks later, the Washington Post published internal agency documents showing that Trump’s EPA was planning to lay off 25 percent of its employees and eliminate 56 programs. One of them was the relatively inexpensive Pollution Prevention program that occupied much of Bill’s work, and which accounts for about $12 million of the EPA’s $8.2 billion budget this year. Although Congress has yet to finalize a budget for 2018, Trump’s proposal signaled to Bill that it might be time to go. After more than two decades with the agency, she retired on Aug. 31. Bill is one of 61 employees who have left the EPA’s Chicago-based Region 5 office between Trump’s inauguration in January and Oct. 17, according to records obtained from the agency through a public records request. None of them have been replaced, as the EPA continues a freeze on external hires. At about the time she left the agency, Bill said she and her colleagues should have been planning for the next cycle of pollution prevention grants, issuing requests for proposals and answering questions about the program. But that work was put on hold, she said, because the agency didn’t know if it would be able to provide the grants to states, which then award the funding to businesses. Bill, 55, started as a geologist in the EPA’s groundwater program and then worked in community relations in the agency’s Superfund program, which prioritizes cleanup of hazardous waste sites. In her most recent position, Bill helped manage the EPA’s Federal Green Challenge, which pushes federal agencies to become more environmentally responsible, in addition to coordinating the Pollution Prevention program aimed at businesses. Since Trump took office, the EPA’s Chicago office has lost 28 employees to voluntary buyouts and early retirements, said Mike Mikulka, president of the American Federation of Government Employees Local 704, the union representing more than 900 EPA employees in the Chicago regional office and across the Midwest. In fact, more Region 5 employees took the buyout this year than any other region except Region 3, which covers five mid-Atlantic states and Washington, D.C., according to data provided by the EPA’s national employee union. That means 33 employees have left without the incentive of a maximum $25,000 buyout or early retirement. “That’s even more than I thought,” Mikulka said. The list of departed employees includes a former acting director of the region’s Water Division; a former director of the Chicago Regional Laboratory, which provides scientific expertise, training and data to support decision-making throughout the region; a former emergency response section chief; two former investigators in the agency’s Superfund program; three attorneys; three engineers; a health physicist; and dozens of other scientific, technical and administrative staff. All of the employees worked out of the Chicago office, except for a water specialist based in Madison, Wisconsin. Together, the 61 former employees account for more than 1,000 years of experience and represent nearly 6 percent of the EPA’s Region 5 staff, which coordinates the agency’s work in six states around the Great Lakes. “I don’t think I remember that many people leaving in such a short period of time,” said John O’Grady, president of the EPA’s national employee union, AFGE Council 238, which represents 9,000 members nationwide. Current and former employees say the loss of staff is already straining the regional office in Chicago. They say that with fewer support staff, scientists and employees in the field must now also perform administrative tasks, like managing records and filling out time sheets. Mikulka said those added responsibilities are especially burdensome for on-scene coordinators at Superfund locations, like the U.S.S. Lead Superfund site in East Chicago, the 322-acre lead-contaminated residential area that more than 1,000 residents were forced to abandon earlier this year. Gebien, who started at the EPA in 1989, had for the past several years worked part-time as part of a phased retirement. He was working 20 hours per week mentoring his replacement for supervisor of the region’s Indiana emergency response section. He wanted to keep working, he said. Gebien, 64, said he wants to find another job, though it won’t be at the EPA. He recently applied for a position with the Federal Emergency Management Agency. In addition to fewer support staff, O’Grady said the agency has a smaller number of inspectors taking samples and checking sites for violations. The result, he said, is likely an increased number of businesses operating out of compliance while filling the air and water with high levels of pollutants. “But we don’t know that because we haven’t gone out in the field,” said O’Grady, who has worked as an environmental scientist in the agency’s Chicago office for nearly 30 years. Region 5 has also sent 20-22 employees to Puerto Rico, the U.S. Virgin Islands and the EPA’s Emergency Operations Center in Edison, New Jersey, to assist with hurricane response efforts, Mikulka said. Among them is one of the region’s two toxicologists dedicated to Superfund sites, which include the most contaminated sites identified by the agency. In less than a year, Pruitt’s EPA has not only cut staff but also refused to ban a pesticide shown to cause brain damage in children, halted requirements that would have reduced water pollution from coal-fired power plants and proposed to eliminate the Clean Power Plan, an Obama administration rule to reduce carbon emissions from power plants. According to media reports, agency decisions are increasingly made by a smaller number of people: Pruitt and a few dozen political appointees. Many of the EPA’s roughly 15,000 career staff have been kept out of the process. 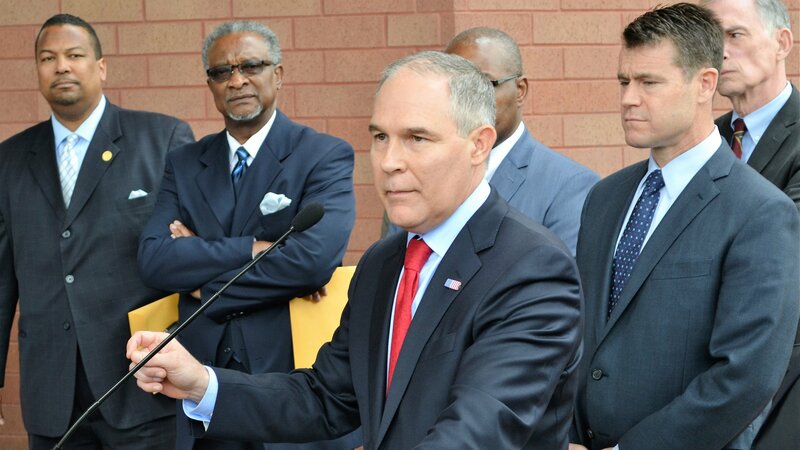 O’Grady singled out Pruitt’s plan to speed up the agency’s work cleaning up Superfund sites, a pledge that O’Grady notes has yet to be backed up by calls for additional funding or staff. Along with concerns about the agency as a whole, Bill said she’s worried about the future of the Pollution Prevention program, which she worked on for eight years before retiring. At its peak in the late 1990s, the EPA’s Region 5 office had about 1,300 employees, O’Grady said. In recent years, even as the Obama administration ushered through a series of environmental advancements, agency staffing of support positions declined, said Margaret Herring, a former Superfund investigator who retired on Sept. 2. Today, O’Grady said Region 5 has just more than 1,000 employees, with no plan in sight to replace recently departed staff. “We’re losing people, and we’re not hiring any new people,” O’Grady said. “And then as you lose your experienced folks, who’s going to be there to transfer the institutional knowledge? Despite reassurances from Pruitt, Region 5 staff are concerned that the Trump administration could close the Chicago office and consolidate the region’s staff with another regional office. O’Grady thinks the administration was at one point considering the idea. Bill, though, is still worried. “I think I speak for many people – I don’t believe anything we’ve been told as far as the office closing or not closing,” she said. O’Grady said the agency might be gearing up for another round of buyouts, with the administration requesting more than $79 million for “additional workforce reshaping” at the agency. Oct. 9: Summary description here. This can be trimmed down as necessary. April 19: The head of the Environmental Protection Agency told residents in East Chicago on Wednesday that the agency had no plans to close its Chicago office. March 20: Cuts to the EPA’s budget would affect a disproportionate number of minority and low-income residents in Chicago, experts say.